The views sold the homeowners on this penthouse apartment. Tall wraparound windows bring an abundance of natural light into the wide-open great room, while the soft palette of gray and white couldn’t be simpler—or more elegant. Antique French ornamental gates—a favorite of the Francophile homeowner—create a sense of separation in the office without blocking the light. The casual sitting room has a collected feel and relaxed vibe; the demilune and the wooden armchair on the left belonged to the homeowner’s mother. An assemblage of whimsical figurines from the homeowners’ collection. Exposed wood in rich finishes stands in contrast to the whitewashed oak floors and white walls throughout. A sitting area in the newer of the merged units has the same sensibility as the great room in the “old” one. The friendship flourished, so when the client and her husband purchased an apartment overlooking Boston Common in 2003, they asked Reid to help them take a blank (albeit grand) slate and make it their own. 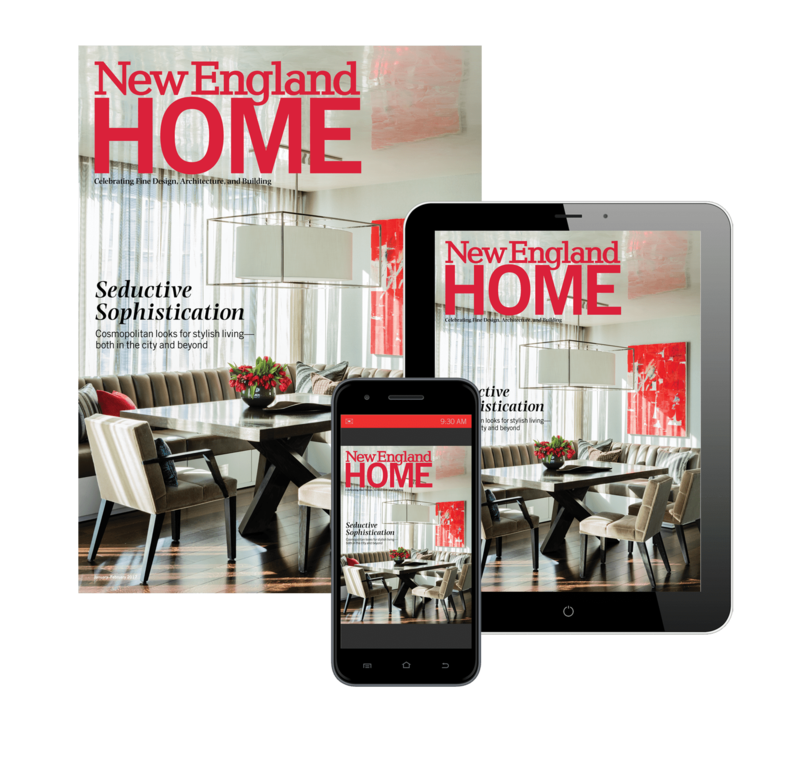 Reid, whose interior design firm is based in Lexington, Massachusetts, has been working on the interiors ever since. She counseled the couple on how to visually combine two spaces after they purchased the adjoining apartment (for its views of the airport), and she advised them again in 2017 when they decided to renovate the kitchen. It’s a singular space in a singular place: a 5,500-square-foot penthouse in the Ritz-Carlton Towers, in the heart of downtown Boston. The designer and her clients opted for bare windows in the common spaces to further enhance the lovely daytime view. And at night, the sparkling lights of the city transform the vista completely. A neutral palette grounds a deceptively simple interior design. All the walls are white, and, with the exception of a dark herringbone floor in the entry, the floors have been finished in whitewashed oak. Up-to-the-minute luxury owns the day, but that allows the sometimes-quirky antiques to stand out. “These are things the clients cherish—many belonged to her mother—and they wanted them to have a place of importance,” Reid says. Even as the furnishings are clearly refined, playful notes abound. To give an office some semblance of privacy, Reid fitted the doorway with one of her clients’ treasured finds: a vintage iron gate. Decorative accents skew toward the fanciful—a stylized tree painted on a wall, a stepstool to nowhere, a pillow with a smiley face, a pink sheepskin throw. Because she had collaborated with Reid in the past, Moynahan says the process of parsing out the many layers of kitchen design was fluid. They worked with a palette of gray and beige, and while the footprint of the space didn’t change much, the design duo cleverly allocated cabinetry to provide storage and accommodate the homeowners’ entertaining needs. Leather-finished marble countertops and a zinc backsplash further the contemporary feel.